Jalandhar Cantonment is a cantonment town in Jalandhar District, Punjab India. 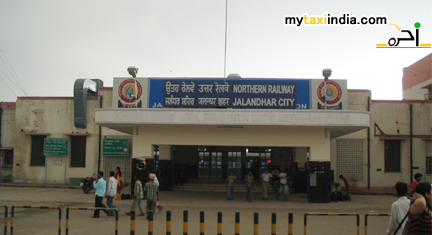 The Jalandhar Cantonment (JRC) Railway Station is a train station in this region. It serves as the major station for most of the popular trains in India. The station is equipped with all requisite modern amenities for passengers to ensure a convenient travel. These include telephone booth, waiting room, restaurant etc. Jalandhar contonment is one of the oldest cantonments in India. The construction of this cantonment originally started in the year 1848 soon after the first Anglo-Sikh War. Initially, the cantonment was restricted to troops to repress disturbances from adjoining States and ensure peace and order. There are many places of tourist interest in the city of Jalandhar. Devi Talab Mandir is located right in the heart of Jalandhar which is just 1 km away from the railway station. Recently a model of Amarnath Yatra has been introduced to the premises. Wonderland Theme Park is one of the major attractions of the city. It is spread over 11 acres and located about 6 km from Jalandhar bus terminus. The park offers a number of thrilling rides for children and adults. The exciting range of water rides includes flying jets, bumper cars, horror house, kids boating, boating, and many more. Kartarpur Gurudwara was built in the year 1656 by the fifth Sikh Guru, Guru Arjun Devji. This gurudwara is located in Kartarpur which is about 16 km from Jalandhar. A grand fair is held annually on the birth anniversary of the Guru. Rangla Punjab Haveli is a traditional Punjabi village themed. It is situated on the Jalandhar Phagwara Highway. Other impressive tourist sites in Jalandhar include St. Mary's Cathedral Church, Pushpa Gujral Science City, Sodal Mandir, Shiva Mandir, Tulsi Mandir, and Moorish Mosque. Hiring a taxi in Jalandhar will help you enjoy the tour in Punjab and areas around better. At My taxi India we ensure you a pleasant tour in and around Jalandhar city and cantonment area as and when required. We undertake extreme pride in offering world class railway and airport transfer services to and from Jalandhar Airport. Hiring our services will help you relish 100% safe and memorable trip to Punjab. We will leave no stone unturned to make you feel special. Right from offering flexible timings to a fleet of well maintained cars, and highly experienced chauffeurs, we take care of all your travel related requirements.